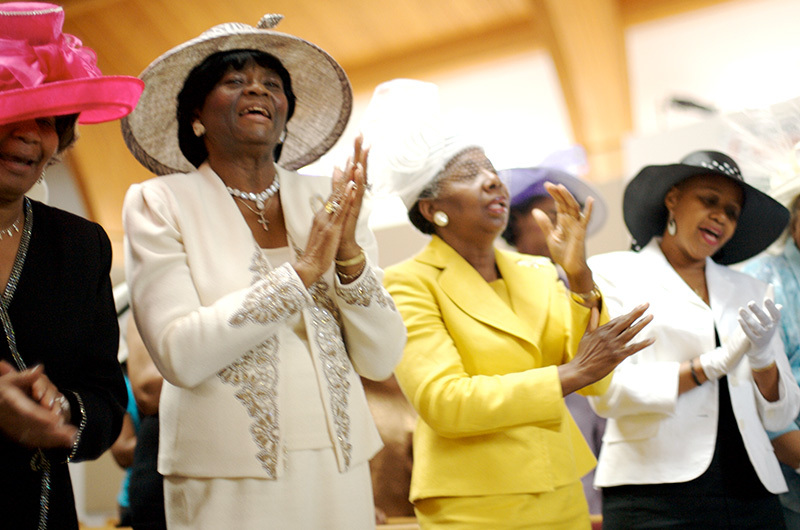 For many African Americans, Easter—sometimes called Resurrection Sunday—is one of the most important religious holidays of the year, as well as a time to reconnect with loved ones. We asked some of our friends to share a few of their most treasured memories, from church parades to family meals to the always-fun Easter egg hunts. This is the first in a new series called “Ways We Celebrate.” We’ll hear from people in different communities about what makes their traditions and celebrations unique—as well as discover the things we all share. To get us started, Chevonn Payton talked to friends and family to learn about their favorite Easter traditions. We celebrate Easter in many ways—but at its heart, the day is a celebration of faith. “Easter’s meaning to my family is the death and resurrection of Jesus Christ. We sit down to a traditional Easter dinner that is as big as our Christmas dinner. Our Easter tradition includes the handing out of baskets, watching the sun in the sky at noon, and visiting family.” —Kimberly S.
“All our aunts, uncles, and cousins would come together on this day and that’s what made it even more exciting. My grandmother of course would make sure everyone attended Sunday school and church to talk about the Resurrection of Jesus Christ.” —Chandra F.
“Easter is a celebration of a new beginning, when Jesus rose from the dead. We usually go to church, have dinner, and do an Easter Egg hunt at my cousin’s home. We always make an Easter basket for the children and for the adults who still love the chocolate bunnies. The Easter egg hunt is a long-standing family tradition and we always look forward to it.” —Vee J.
Easter Sunday’s church service is always the focal point of the day. The continual message of hope, reflection, and new beginnings resonates throughout the service and the day’s activities. “It’s kind of like a party to celebrate Christ rising from the dead. “—Cherie P.
And you can’t attend a party without wearing the right attire. On Easter Sunday, everyone gathers in their Sunday best to celebrate: Think new suits for the men and boys and beautiful pastel dresses paired with hats and gloves for the women and girls. “Everyone takes it up a notch. The new clothes represent a new life for Christ. As kids and even today, we always dressed to the hilt. It’s tradition. It’s the way we were raised.” —Kim B. “I enjoy seeing kids in their Easter outfits. It was always a thing to dress up for Easter in your best. Like the birth of Spring. I still enjoy that part.”—Danielle W.
“As a family celebrating, Easter was so fun. We all got dressed up: the girls in fancy dresses, white gloves, and straw hats. The boys wore three-piece suits. That was the only time you could get them to dress up.” —Chandra F.
Recycle outfits. We love seeing the kiddies dressed up in their fancy dress attire; however, kids nowadays grow so fast it’s unlikely they’ll be able to wear the same Easter clothes year after year. Ask your friends and family if their kids have any gently worn clothes from last Easter. This year, to make the looks their own, change up a detail on the outfit: Add a belt or a sash, or a special tie or pin. The church service is just the beginning; it’s the Easter activities before and after church that make the day truly special. Easter programs—whether they’re pageants, plays, or parades—are more like an Easter variety show, with a little bit of singing, performing, speaking, and sometimes dancing. The programs give kids a chance to share what they learned about Easter and (most importantly) to show off those Easter outfits. “We’re throwing a homecoming party for Jesus. The special clothes, Easter speeches, parades, and Easter egg hunt was our way of showing thanks to Jesus and celebrating him.”—August C.
“The parades gave all the kids a chance to show off our Easter clothes. But the plays were nerve wracking. Each child would be given something out of the Bible that you had to go up to the front of the church and read it in front of everyone.” —Cherie P.
“We loved being in the Easter plays. The younger kids would get four verses about the resurrection while the older kids performed in plays about the resurrection. It was always fun to get up there with our friends and family and recite our lines.” —Kim B. “A month or so before Easter each of the kids would be assigned an Easter speech. Some speeches were biblically based, and some were short sentences. The younger kids usually had speeches while the older kids were assigned to the Easter pageant. And every year there was always one little girl that would cry through her speech. Every year we hoped that she would make it through the speech, but she never did, and it always made everyone say, “bless her heart.” —Dierdra Z. Practice makes perfect—but don’t overdo it. Work with kids to practice their walk and speaking lines. Remind them to breathe and have fun. Tell them their surrounded by friends and family who will be cheering them on. Tell them they’ve got this. And no matter what, you love them and are so proud of them for getting up there. On your mark, get set, hunt. For kids, the highlight of the day typically came in the form of tiny, colorful eggs hidden in different locations at home or at church. “I would hide colorful Easter eggs filled with goodies along with the traditional boiled eggs we decorated the night before. There were two special eggs: One golden egg was filled with money and one was not. The golden egg was like the golden ticket and every child knew that there was money inside. The child who found the golden egg without anything in it had the most special egg of the entire Easter egg hunt. The empty golden egg represented the empty tomb as told in the Bible—Jesus rose on the third day, but his loved ones found an empty tomb. The kid who found the golden egg was made to feel extra special and was given the grand Easter egg hunt prize.”—Ayanna G.
“When I was younger we have a tradition of Sunday church followed by the big Easter egg hunt on the church grounds. After the Easter egg hunt we will all go to Grandma’s house for dinner. Those days were truly golden, and I cherish those times as I look back on them as an adult.” — Danica B. 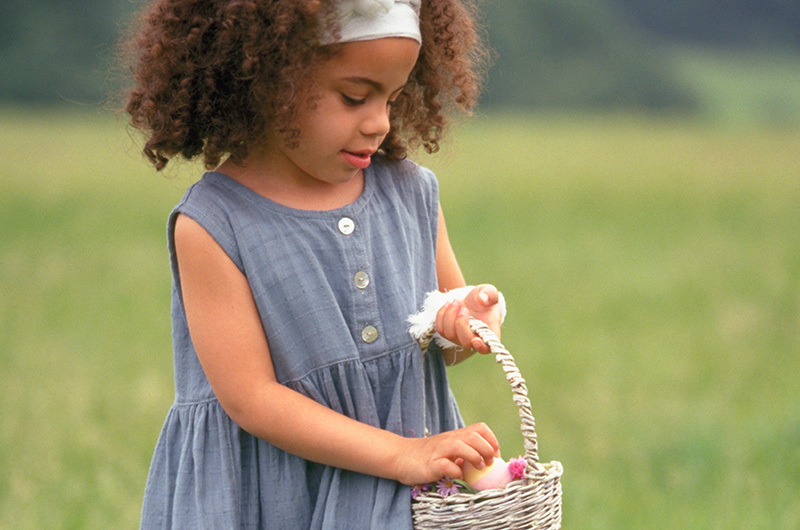 Planning an Easter egg hunt for your church—or the whole neighborhood? These hints will help make it easy. 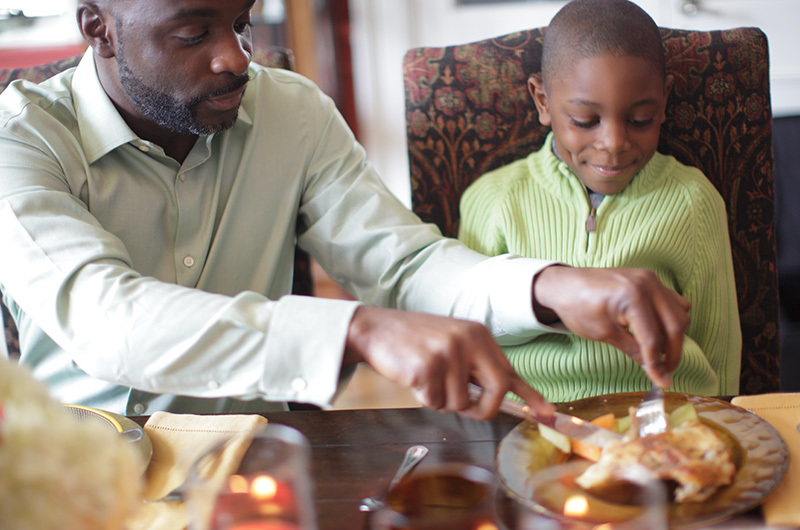 The day typically ends with family dinner. 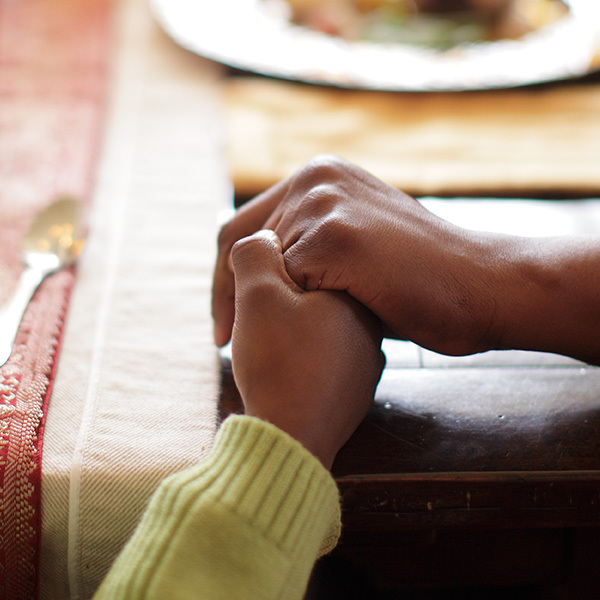 Whether we’re having a meal for two or 20, or eating at home or going to a restaurant, the idea of the Easter family dinner tradition is to celebrate togetherness. And since Easter dinner is typically the first big family meal of the year, we pull out all the stops. We’re talking about everything from making special family favorite foods to using the fancy cookware, to bringing out the card table for games, and listening to old school music. “Everybody would cook and bring a dish to Momma’s house. We’d have potato salad, greens, ham, cornbread, black eyed peas, rolls, green beans, and pies. Lots of pies. There’d be so much food we would encourage everybody to come—whether you went to our church or not. We had an open-door policy on Easter. Nobody got turned away.” —Kim B. “I try to get a head start on our Easter dinner by prepping the night before. The dinner usually consists of brisket, baked chicken, pineapple brown sugar glazed ham, homemade macaroni and cheese, greens with smoked jowl, mashed potatoes and gravy, green rice casserole, a key lime pie, and homemade pound cake for dessert. As part of my family tradition, growing up my grandmother and mom always believed in feeding anyone who wanted to eat, so in preparation of that we cook for everyone’s differences and preference, by cooking and baking dishes with variety and flavor.” —Ayanna G.
“After church, we would head to my parents for Sunday/Easter dinner. Ever since we were kids, we’ve had gumbo. I have no idea how that tradition started in our family, but it’s delicious and it’s what we do.” —Alisha A. Create an Easter Sunday playlist. Ask family members to send you their favorite gospel songs to create the ultimate Easter playlist to play during your family gathering. Host friendly family cook-offs. Find out who really makes the best sweet potato pie and give the winner bragging rights (until next year). Count your blessings. After yummy dishes and desserts, ask each person to share his or her favorite Easter memory from the day.